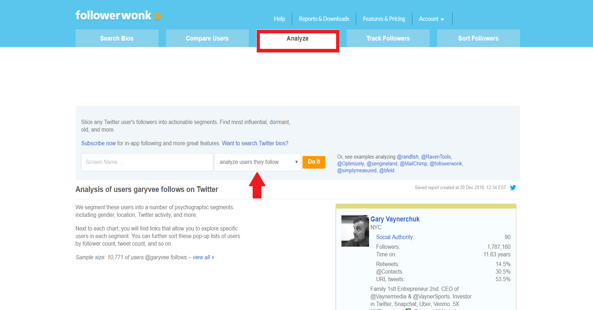 Followerwonk allows you to find, analyze, and optimize Twitter analytics to gather information on Twitter users, scope out popular accounts, and identify potential brand influencers. Comparing Twitter accounts, your relationships with your followers, or your competitors, the insights help you optimize your content to serve what your audience likes best and grow your reach. 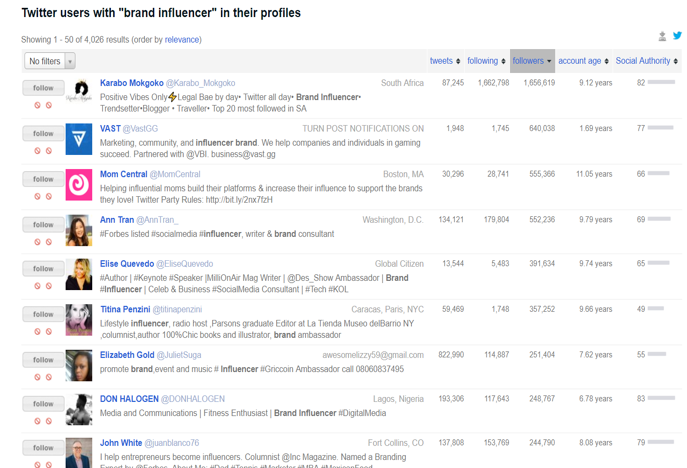 To analyze influencers’ followers or analyze users they follow, click the Analyze tab at the top navigation menu and choose which segment you want from the drop-down menu. On the next screen, you see the geographic location of your segment. It’s imperative to find influencers that are the right fit for your brand’s values, personality, and audience. Employing AI to discover influencers makes the process more efficient and effective, allowing you to successfully widen your audience and meet business goals. You also can find influential Twitter users by keywords under the Search Bios tab and filter the top profiles by category (i.e., number of tweets, number of followers, social authority). Pricing: Free for limited access. The most popular plan is the Target (up to three profiles) for $29 a month. Transform your customer care by providing personalized social interactions and improving customer experiences. Buffer Reply helps provide real-time answers and support to customers’ social outreach in a natural way. Under the Publish tab on the main menu, you can schedule and publish posts to your Facebook, Instagram, and Twitter accounts. 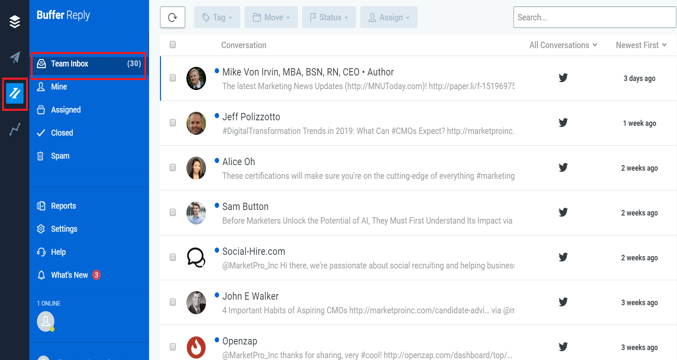 Under the Reply tab under Team Inbox, you can access and monitor your brand’s social mentions. While AI technology like chatbots is transforming customer service, it can’t replace the personal touch or emotional intelligence humans inherently have. The information under the Reply tab shows you everything about the person you’re talking to, including your conversation history. This way, you deliver meaningful conversations and focus on the ones that matter. 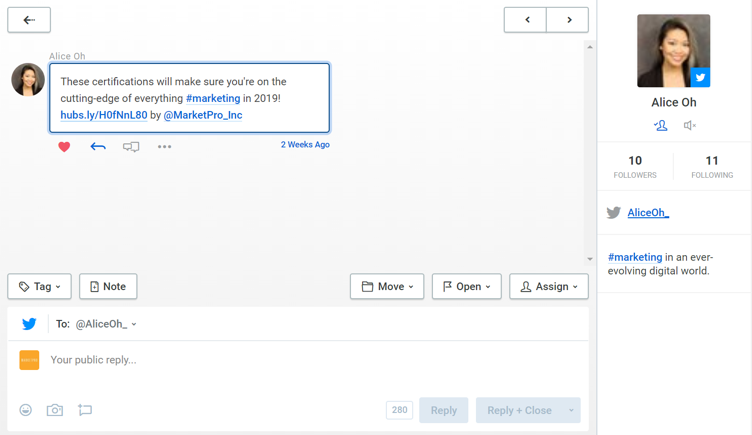 Tools like Buffer Reply house and organize all your mentions in one team inbox, allowing you to have a central location, which enables your brand to maximize your customer care efforts. Building strong relationships comes from personalized and consistent customer service, so you can continue to delight your audience. Pricing: Plans start at $50 a month. Use Unmetric to optimize your social media content strategy. By discovering new content ideas, tracking branded content, and analyzing top brand leaders and competitors, this tool will improve your content engagement. Click Discover on the main navigation pane to explore popular posts based on keywords, events, or hashtags. Filter the results to display specific industries, geographic locations, or time period in the top right. 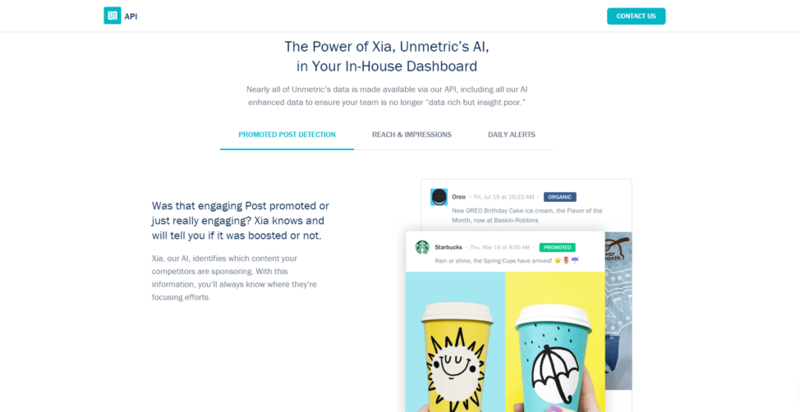 Leveraging AI tools like Unmetric gives you data to identify any gaps in your social media content efforts so there’s no need for guessing in any part of your social strategy. 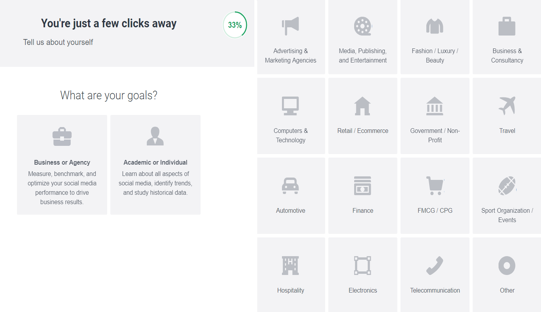 If you don’t have a trend to analyze and need some inspiration, click on the Explore page to uncover in-the-moment popular topics in your industry. You also can filter results by regions, categories, or months. 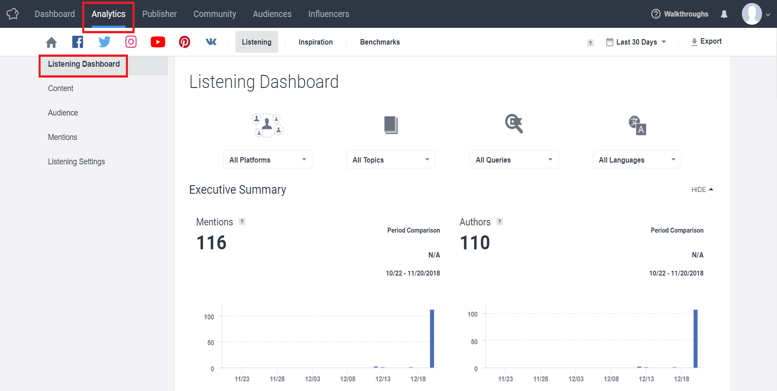 Its interface allows you to pipe AI-enhanced social data on over 100,000 brands directly into your dashboard and in-house proprietary tools, putting key insights at your fingertips. Pricing: Plans start at $99 per user per month. Socialbakers is a comprehensive AI-powered social media marketing suite. It helps you better understand your audience by using data to define buyer personas and identify what content they engage with, their interests, and the influencers they trust. Grow your customer base and measure the impact of social media on your business with this tool. Upon creating your account, specify your goals and the industry you’re in. Socialbakers also offers a social-listening feature. Go to the Listening Dashboard under Analytics. Under the Publisher tab, you can schedule and organize your social media posts. With AI-powered tools, you can better identify your buyer personas to deliver significant improvements to your social media ROI. It makes it easier to target the right messaging to the right audience at the right time through the right channel. Pricing: Plans start at $20 per profile. It’s impossible to have a successful brand without a social media presence. However, just being on social media platforms isn’t enough. Social channels must be employed properly to reach their potential, achieve maximum output, draw in more customers, and increase ROI. Social insights delivered by tools like the ones discussed offer better consumer intelligence by filtering out signals from noise and allowing marketers to use these actionable insights and better serve their audiences. 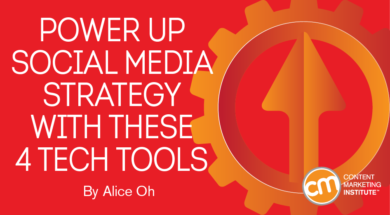 What tools would you consider using for your social media strategy? What other tools would you add to this list? Share your thoughts below! Get the latest and most helpful information on how technology can improve your content marketing results at ContentTech. Register today for the April 8-10 event in San Diego. Use the code BLOG100 to save $100.